You need to start looking for the crown as soon as you feel it coming off. Be watchful of the loose crown when brushing, eating, and flossing your teeth. Find the crown if you can and keep it in a safe place. If you have accidentally swallowed it, there’s no need to panic, as it will pass without a problem. It’s essential to pay a visit to your dentist’s office and get an appointment, losing a crown is a dental emergency if you can’t bear the discomfort and pain request an urgent appointment. Most dentists will reattach a crown without any additional charges if they were the ones who originally created and placed the crown for you. If you have the crown with you, clean it with a toothbrush gently and take it with you to the dentist’s office. 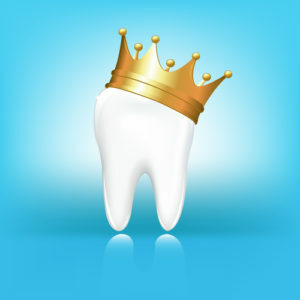 If you have the crown, the dentist will be able to refit it before the exposed tooth is damaged or decayed. For some reasons, if your dentist is unable to see you right away, take some home remedies to help in pain relief. Or buy some dental wax to cover the exposed tooth until you can get into see the dentist. While you wait for your next dental appointment, there are some safety tips that you can use to keep the tooth and the crown safe. When you have the crown that fell off, place it on the tooth gently if possible and put it back using over the counter dental cream. You can add a small dab of toothpaste to help keep it in place. Before applying, the dental cream is sure to check the position of the crown to see whether you have placed it correctly. Test to see if the crown fits correctly or not. Try biting down to see if the crown will retain its shape and position before applying the dental cream.